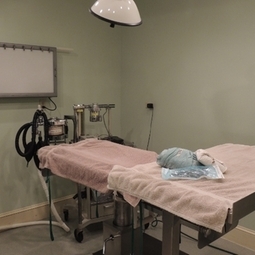 If your pet is scheduled for a surgery or anesthetic procedure (dental cleaning, sedate for x-rays, etc. ), you may not know what to expect when you drop him/her off with us for the day. Here is some general information that may be helpful. THE DAY BEFORE YOUR APPOINTMENT: Our front desk staff will call you the day before your pet is due to come in for surgery. They will remind you to make sure your pet does not eat after midnight the night before your appointment. This helps to prevent vomiting during or after anesthesia. Your pet may have free access to water. If your pet is on any medications, ask the front desk if you should give those medications the day of surgery. THE DAY OF YOUR APPOINTMENT: You should bring your pet in to be admitted to the hospital between 7:45 and 8:30 AM the day of your scheduled appointment. At that time our front desk staff will confirm the procedure(s) to be performed and will also have you review and sign our anesthesia release form. Please let us know at this point if there are any special instructions or if you have changed your mind about any of the procedures planned for your pet. If your pet is scheduled to have a lump (or more than one lump) removed, it is helpful for us to either have the area shaved or marked with colored marker to make the location of the lump(s) obvious. PLEASE ALLOW AT LEAST 15 MINUTES FOR THE ADMISSION PROCESS AND PAPERWORK. Our anesthesia release form contains several questions for you to answer pertaining to your pet?s surgery/anesthesia including options for preoperative bloodwork, extraction of retained baby teeth, extraction of damaged or infected teeth if your pet is here for a dental cleaning, permission to send out a biopsy sample for our mass removal patients, implantation of a microchip and use of pain medication. Most importantly, you will need to provide emergency contact numbers where you or another responsible party can be reached at any time during the day. PREANESTHETIC BLOODWORK: It is never a bad idea to run bloodwork on your pet to make sure that the major organ systems appear normal before anesthesia. We can see abnormal results in pets of any age that may appear completely healthy otherwise. Our basic preanesthetic panel includes a PCV (to make sure your pet is not anemic), liver and kidney values, blood sugar and protein levels. The veterinarian may recommend more comprehensive labwork if your pet is older or has a preexisting medical condition. We require preanesthetic bloodwork on all patients over 8 years old, but recommend it for everyone. Most often, we run the bloodwork the same day that your pet is here for his/her procedure. If there is anything abnormal on the tests, we will call you before we do any anesthesia. Depending on the abnormality, we may recommend further tests or may still be able to do the procedure with follow-up monitoring of bloodwork. We are able to run the bloodwork several days before your pet?s procedure if you would like to know the results ahead of time. You can call to schedule a technician appointment for a blood draw if you would like to do testing before your scheduled surgery date (recommend 3-7 days prior to the procedure). DENTAL EXTRACTIONS: If your puppy or kitten is here for a spay or neuter procedure, we may find that there are baby teeth that did not fall out when the adult teeth came in. We call these retained baby teeth. You may not know that these teeth are present, but the veterinarian will examine your pet?s mouth while it is under anesthesia and make note of any retained baby teeth. We recommend pulling any baby teeth at the time of surgery so they do not cause a problem later on (overcrowding of the teeth or dental disease related to food collecting around the baby tooth). The exception to this would be if we find a baby tooth present, but no corresponding adult tooth. We would not extract the baby tooth unless there is an adult tooth present. It is important that you indicate on the anesthesia release form whether or not we have permission to extract any retained baby teeth found while your pet is under anesthesia, otherwise we may need to schedule a separate appointment to have these teeth removed at a later date. If your pet is older (> 1 year) and is here for a dental cleaning, we may find teeth that are loose, infected or damaged and should be extracted. We do not remove any teeth unless it is medically necessary to do so. Extractions are done at the veterinarian?s discretion after careful examination of the mouth. Infected or broken/damaged teeth can lead to dental abscesses, pain when eating and sometimes can lead to infections elsewhere in the body as the bacteria can enter the bloodstream and travel to the heart, kidneys or liver. It is important to extract these problem teeth to keep your pet healthy and prevent problems in the future. PAIN MEDICATIONS: Any surgical procedure can cause pain and swelling for several days after your pet comes home. We routinely use a therapy laser to treat the incisions right after surgery to help speed healing and decrease inflammation. We strongly recommend the use of pain medication at the time of the surgery to help prevent the onset of pain and also recommend medication to go home to allow a smoother recovery for your pet. The use of pain medication is mandatory in our feline declaw patients. The veterinarian will make a decision as to which drug is best for your pet based on their age, weight and preoperative bloodwork results. You will have the choice of liquid or pills for you to give your pet at home. Additional charges may apply for liquid medications. PERMISSION TO SEND OUT BIOPSY SAMPLES: If your pet is here to have a mass(tumor) removed, we may recommend sending the mass (or a portion of the mass) to an outside lab for review by a pathologist. This tells us exactly what type of tumor we have removed, checks the edges of the tumor to make sure that the excision was complete and gives us information about whether the tumor may spread to other areas of the body. This information is always helpful in predicting any future problems your pet may have related to the tumor itself, but you may opt to decline a biopsy if you choose. MICROCHIP IMPLANTATION: If your pet does not currently have a microchip, you may want to consider having one implanted while they are here for surgery. It is a simple procedure that involves injecting the microchip (about the size of a grain of rice) directly under the skin between the shoulders. A microchip can help to reunite you with your pet if he/she is ever lost and can also enable you to register your dog for a lifetime license with York or Adams County (this means that you do not need to renew the license every year). If your pet has a microchip and is lost, the SPCA/Humane Society/or local vet should scan the pet and be able to contact the microchip company to get in contact with you. We use HomeAgain microchips ? for more information on HomeAgain microchip services you can go to www.homeagain.com or call 1-888-466-3242. RABIES VACCINATION: If your pet is due (or overdue) for a rabies vaccination at the time of your scheduled procedure, we are obligated to give the vaccine while he/she is here. Pennsylvania law mandates that all cats and dogs must be vaccinated for rabies since there is potential transmission to humans via bite wounds or scratches. The veterinarian will determine if there is a medical reason why your pet should not receive the vaccine. FLEAS: If we notice fleas on your pet while it is here for a surgery/anesthetic procedure, we will administer a tablet (Capstar) to kill any live fleas. Fleas can sometimes wander toward our surgery sites and cause contamination and can also be transmitted to other patients while here, so we want to take every step to eliminate them before they cause a problem. EMERGENCY CONTACT INFORMATION: We will ask you to provide emergency phone numbers where you (or a responsible party) can be reached during the day in case we have questions or there are any complications with anesthesia. Unfortunately, we cannot predict at what time each procedure will be performed during the day, so it is important that you are accessible at the emergency numbers you provide. There is a copy of the Anesthesia Release Form for Clearview Animal Hospital available that you may print out to review ahead of time.